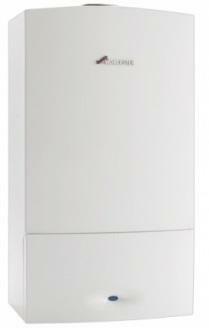 DISCONTINUED.This boiler is now discontinued by the manufacturer but can still be used in the Comparison Tool. The Greenstar 28i Junior from Worcester-Bosch is a compact condensing boiler available in natural gas and LPG (Liquefied Petroleum Gas) models. The Worcester-Bosch Greenstar 28i Junior employs a heat cell constructed from cast aluminium and silicon with a large surface area such that more heat from flue gases can be extracted and the boiler is more efficient overall. Indeed the Worcester-Bosch Greenstar 28i Junior can reduce domestic hot water and heating bills by up to 20% as well as reduce the amounts of carbon dioxide and nitrogen oxide pollutants released into the atmosphere. The compact dimensions and light weight of the Worcester-Bosch Greenstar 28i Junior means that it can be lifted and installed by one person. A mounting frame with pipes to the rear means that no pipe work needs to remain exposed following installation and multi-directional 100mm or 125mm flue systems can be run horizontally or vertically including 45' or 90' bends for flexibility.